Give us any bike, we’ll continue the cycle. 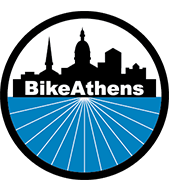 Donate bikes at our shop during any of our open hours, contact us to make other arrangements, or drop them at the Athens-Clarke County CHaRM. Bike Recycling Program volunteers refurbish bikes to donate to clients through our service partners. We sell some of our refurbished bikes in our retail shop to help us cover overhead costs. We strip bikes that are beyond repair for useful parts, then separate the metal and rubber to recycle. We put donated parts to good use on bikes that we work on, or sell them in our retail shop for others to use. We welcome used locks, lights, bags, mirrors, bells, pumps, car racks, trainers, and other bike accessories. We accept gently used jerseys, jackets, and cycling shoes to sell in our retail shop, but we prefer not to receive used helmets or cycling shorts.